In anticipation of the big event, I thought I'd share some of my favorite Oscars with you. This wiener's got sauce! Geez... where's my radar detector? Let's see... what could be on the menu here? 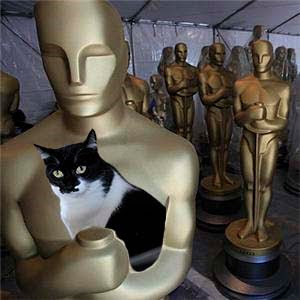 All the movie stars want to hold Oscar. But look who Oscar wants to hold. You going to win an oscar? Wow!! you got to drive that wiener? You have our Oscar vote!! I think I like your Oscars better than the movie ones. I think Oscar is a very smart guy see'n as he's holding on to you. We'd vote for you to get an Oscar Katie! Yoo're awesome! We think you're an Oscar-winner just for being yourself, Katie! It is really amazing how you can tele-kitty-port yourself to so many times so quickly! What's your secret? I'm looking forward to seeing you on the red carpet Katie! Will you be presenting too? Love our pics - you definately will win the Oscar cuz he likes you best! Good jog with the Oscars Katie. Love you driving the hot dog. That looks like so much fun. You just about do everything don't you Katie. Katie, I really enjoyed all the oscars, especially the one holding you! oh Katie, very smart girl!I loved your post. I'm also waiting anxious about the winersFor sure you will get your Oscar because you are talented and beautiful! We would give you an Oscar, but they won't let us vote. Katie! I think Oscar IS the winner because he has YOU!! 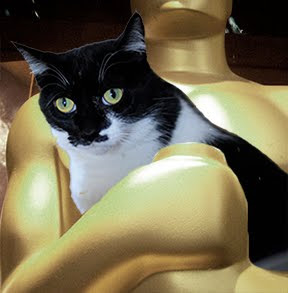 ...and the winner, for best kittycat in a black and white film, is...Katie!! Yeah! Oscar sure is smart to want to hold you! You are a superstar Katie. Pee Ess...I love the weinermobile! It reminds me of the Hams of the Werld tour. Oh who could resist holding you katie! We love all those Oscars! Have yoou decided what you're wearing for the awards? Are you borrowing your mama's Jimmy Choos? We think your blog deserves an Oscar! Mom's Aunt has a picture of her IN the Wiener Mobile! Her aunt is Brind'Amour's mom. Have fun watching the Oscar's and tell GloGirly to get the tissues ready for when she starts drooling over the Jimmy Choo's. MOL! Hey I have seen women wear tuxedo's to the Oscars, so you won't have to rent a tux. I am glad you are already making friends with all those statues. I will be watching to see how things go. You should sweep the board with all your Oscars. We would vote for you. 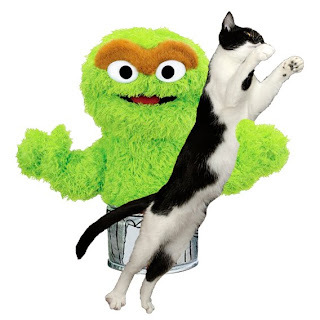 Oscar Oscar! Mom loves the Academy Awards. Katie, you win paws down! Congratulations Katie! I just presented you with the Sunshine Award because your reading your blog always puts a smile on my face. Please see my blog for details. Oh Katie..you are to much. 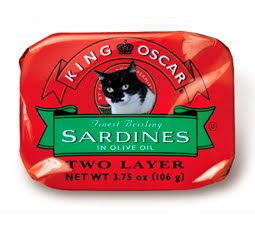 We like Mr. Oscar sardines the best. 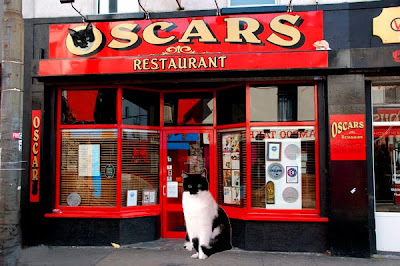 Oscar has very good taste! Especially since he wants to hold you. You definitely should win an Oscar, Katie! I think the wiener is my favorite kind of Oscar! But I do enjoy watching the Oscar fashions on TV. MOL! Love the weiner mobile! You are so clever, Katie, with these different Oscar pictures! I enjoyed this much more than the real thing! 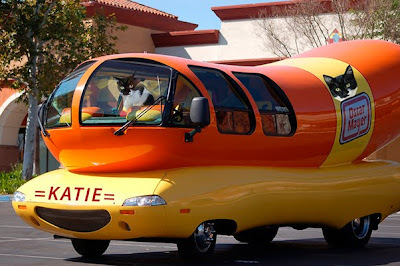 We LOVE your wienermobile! Do you let Glogirly borrow it to run errands? Katie those are all great pictures! We hope you enjoyed the Oscars!